Here are two cars that need no introduction. The Honda City is a car that changed the segment once and for all when it was launched in India more than a decade ago. Hyundai Verna was a car that carried forward the legacy that was hard earned by the Accent, and how. After many revamps and many more avatars both these cars have reached a different level all together, the new Verna in its fluidic avatar looks like something that is born to cut through air and go faster. The Honda City, on the other hand, has been finally given a diesel engine, but is it refined enough to best the likes of the biggies out there? 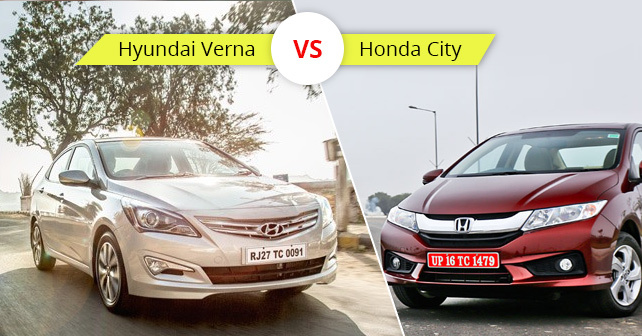 We do our Honda City vs Hyundai Verna to find out. The front end is largely the same as the last-gen model, save for the ostentatious chromed front grille and larger headlamps. The last-gen City had its back-side inspired from the last-gen BMW 3 Series, and guess what, this new one pays homage to the latest 3 Series. The new Honda City is as long as the outgoing model (4.4 meters), but the wheelbase has been increased by 50mm to 2.6 meters and that makes a huge difference. Even the shoulder space has gone up by 40mm, despite the width of the car remaining the same. As a result, the space inside is – and there’s no other adjective for it – immense. The interior has been given a complete do-over, and now it features things like push-button start, climate control with a touch sensitive panel, a parking camera (which is a bit specious in its function), steering mounted controls, options to play all formats of music, rear aircon vents, and my favourite – 4 charging points. The 1.5 litre i-DTEC engine that does duty in the Amaze finds a home in the City too. Mated to a slick 6-speed manual gearbox, it generates 99bhp, which peaks out at 3,600rpm and 200Nm comes into play at 1,750 revs. Sure, Honda has invested heavily in containing the NVH levels, but it feels like the City needs a much larger effort to dampen the noise. The steering feels jaded, wooden and artificial. The ride is soft and plaint, and though we couldn’t throw the car around bends or corners, it felt pretty confident doing high triple-digit speeds – so stability isn’t an issue either. The City, in its latest avatar, ticks all the right boxes. The equipment levels are good, it rides well over bumps and has a very comfortable cabin. It even manages to look like the FCX Clarity from the front and the 3 Series from the rear. Plus, there’s all that space inside – and that’s a massive deal-maker. Honda has been working overtime in ensuring that it hits back with a bang, and they seem to have managed just that with this new Honda City. Ever since Hyundai launched the Fluidic Verna in 2011, it changed the mid-range sedan market with its radical exteriors, an array of comfort and safety features the likes of which had never been seen in this segment, and its powerful engines – especially the 1.6-litre diesel. It ruled this segment for three years, before the competition caught up as the Hyundai Verna started to age. To match up to the Honda City last year, it did receive a minor upgrade with an LED strip in the headlamp cluster and a mildly tweaked suspension. But is it enough to beat the likes of the Honda City? Read on..